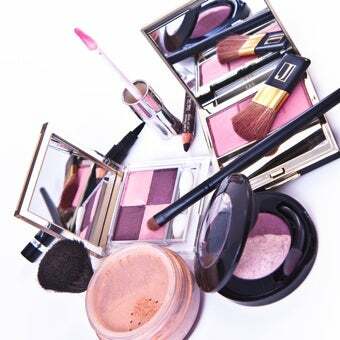 This week's Beauty 101 is focusing on makeup removal and making sure cosmetics are used safely. You had questions; your fellow readers have come through with the answers. As others here have said, it's absolutely essential to remove all of your makeup every night. If you don't believe me, and you're willing to risk some blemishes, try leaving your makeup on for a couple of nights and seeing what happens. For me, the hands-down best makeup remover has always been good old cold cream. Slather it on, wipe it off with a tissue, repeat if necessary (though it's rarely necessary) and get on with your life. I find that it works especially well on eye makeup and on those long-lasting, everything-proof lipsticks that the manufacturer hopes you'll purchase an expensive little bottle of stuff to get off. Super-cheap, too — I've been using the same tub of store-brand cold cream for a couple of years and I'm only halfway into it. For some reason, cold cream doesn't seem to work for everyone — I think it may not work as well on really oily skin, but that's just a guess. If it doesn't work for you, keep it around to smear on your forehead next time you dye your hair so you don't dye your skin, too. Eye makeup tip: Instead of purchasing expensive eye make up remover, you can generally use your moisturizer for almost all eyemakeup removal needs, even waterproof stuff. Dab moisturizer generously in area you want to remove (or apply moisturizer to finger and then close lashes along the fingertip) and then wait about a minute. Remove with cotton pad and/or q-tip. Best cheap makeup remover (works on waterproof stuff): olive oil. Or baby oil, if you have that. If you haven't tried using oil to cleanse, it's not that scary. You can use it on your entire face. I apply it, rub it in a little, wet my hands, lather it up, then rinse it off. It leaves you surprisingly not-greasy and the oil in it breaks up whatever is keeping the waterproof stuff on. Other great cleansers that are cheap and work for almost everyone: Cetaphil and CeraVe. I remove my make-up with baby wipes. They don't irritate skin and they're super convenient. I keep some next to my bed, no matter how tired I am it's no hassle to reach over and wipe my face clean. Oh and don't forget, super cheap! I buy in bulk at Target. Best cheap makeup remover? Oil (NEVER mineral oil!! olive oil and almond oil and vitamin E oil are nice). Sounds crazy but I learned this in a theatrical makeup class and have never gone back. Wiping afterwards with a hot, damp towel removes most of the oil, all of the makeup, and leaves you moisturized. Vaseline is not recommended for use around the eyes. It can clog the tear ducts, cause stys and milia and actually trap dirt and bacteria around the area if not fully removed. It's an extremely risky thing to do and cause serious problems. I've worked with dermatologists, cosmetologists and make up artists for years and all discourage the use of Vaseline on the face, especially the eye area. I've seen people who have suffered from the above problems and been left with scarring from having to have them treated. Cleansing oil or balms! This is truly the greatest stuff for make-up removal, even though it's a bit pricey. At first it feels weird, because you rub the oil directly onto your skin without wetting it first, but after a minute or so of rubbing, you splash your face with water, the stuff emulsifies and all your makeup—even eyeliner and mascara—is completely gone! This stuff is like magic. As someone with dry skin and a serious case of laziness, these cleansers are especially awesome because I don't need to use a regular cleanser afterward, although people with combination or oily skin may want to. I love Boscia's makeup breakup cleansing oil, in spite of the ridiculous price tag. Also good: Clinique take the day off cleansing balm, MAC cleanse off oil, Origins clean energy, Shu Uemura. Apparently there are recipes floating around on the interwebs for DIY cleansing oil, but I've yet to explore this option. As far as a great gentle makeup remover, try Neutrogena Oil-Free. It's pretty cheap and it lasts for several months. Clinique make s agreat makeup remover as well, but it's much more expensive. When you DO remove eye makeup, I suggest gently holding a cotton ball soaked in the stuff and lightly rubbing it away. Rub into the inner corners of your eyes to avoid tearing the under-eye tissue. It prevents wrinkles later on. Definitely remove makeup every night ladies. If you don't, it can clog pores (the main problem) which can lead to all sorts of other developments, like acne, dry skin, and poor skin growth and development. Do NOT share makeup, especially eye makeup. The bacteria and other organisms that live in your eyelashes and eyebrows are specific to YOUR BODY ONLY and can cause infection and a host of other problems. I'd say that aside from common cold and other mild mouth-to mouth sickness, a shared lump of lipgloss is probably fine, assuming you know whoever it is you're sharing with. Non-waterproof makeup comes off with saline solution. No lie. Just saturate a cotton ball with saline solution, hold to the offending area for a couple of seconds, and then rub. Do this before you wash your face, then go over it with your regular face cleanser, and it will remove almost all traces. Super cheap, completely healthy for your skin and eyes, and if you are a contact wearer, already there in the cabinet. You can even use it on a q-tip to clean your waterline, if you pull your eyelid away from your eye. Also, if I've accidentally gotten mascara on my eyelids/cheeks and I don't want to take off all of the makeup I just put on, I'll dip a q-tip in my eye cream and then glide it over the mascara mark. Comes off instantly, doesn't leave residue, doesn't mess up anything around it. And then you can go over it and blend. Most cosmetics sold in the US (I don't know about other countries) have a tiny symbol now that indicates the product's shelf life. It looks like an open jar and shows the number of months the product can be used. Nail polish can last a long time, say, 36M; mascara, on the other hand, is usually more like 6M. You can find it near the ingredient listing (if that's printed on the product itself, rather than on the cardboard packaging) and instructions for use. If there's no ingredient listing or shelf life symbol, it could be an outdated product that you might not want to use. Products are almost never useable after they expire anyway, and if you still have any left at that point, you're probably not using it very often. Toss it. It's hygienic and, more importantly, safe, since we don't always know what happens to cosmetics' chemical compositions after they expire. Mascara is MAXIMUM six months and must be chucked immediately if you have an eye infection while using it. Those tubes are a hot bed of bacteria. This is not an industry trick to get you to buy more product, it's to prevent infection. Wet products like concealer and foundation don't last as long if you apply directly especially if you have acne or other open skin conditions. You're simply transfering infections or bacteria back and forth. Scrape some product on the back you hand with a Q-tip or the end of the brush and apply from there. Cream products don't last as long as powders, especially things like blushers which you stick your fingers in. Wash your hands before doing so! As long as you aren't putting spit or fingers (a lot of people turn eyeshadow into liner with spit) then powders last ages. Use water instead and keep brushes clean. And NEVER EVER EVER share lipsticks, balms etc unless they have only ever been used with a brush that has been alcohol cleansed between uses. That's cold sore-tastic. Same goes for mascara and liquid eyeliners. DO NOT share wet products that touch the lashes. The only colour your eye will be is pink..
how long does perfume last? - depends. keep it away from direct sunlight and in a dry area - not too hot or humid (like on your dresser or in a cabinet). don't shake the bottle either as it can break down the chemicals faster. kept in a cool dark place, perfume can last a little over a year or so and it will start to break down after that. that being said, ive had bottles for years that still smell fine so...it will smell best early on but eventually you will either have to use it all or toss it. also - dont spray and rub! spray the fragrance on your pressure points individually (wrists, back of neck, decolletage, back of knees) but rubbing the sprayed skin together breaks down the scent. spray and go! A good rule of thumb is to replace your mascara quarterly at least. Mascara will start to get a sort of sweet smell when it has gone bad and will begin to clump more. Anything liquid, gel, or cream needs to go after about six months and will develop clumps. Powders (pressed or loose) will keep for a year, but it's hard to know when they're past their prime. I wash my brushes every night. It's essential for my eyeliner brushes and any brushes used for creamy products. They turn hard as rocks otherwise. I wash them with a little spray of MAC brush cleaner and a rinse of water. (Putting it in a little spray bottle makes it go a long way.) Then I lay the brushes flat to dry. For foundation and lip brushes, the only thing that cuts it is a mix of olive oil and dishwashing detergent. Like a drop of each for a brush. Works like a charm. I use baby shampoo to clean my brushes. It's gentle and non-irritating to the eyes. You don't want to put anything on a tool that's going near your eye ball that would cause damage. That being said, rinse the brush well, and rub gently to make sure all the shadow/product is removed, from base to tip. Then re-shape the brush while it's still wet, and lay on a clean towel to try. I store my brushes fluffy end up in a glass mason jar. I NEVER share brushes or makeup (especially eye makeup) with anyone, not even my own mother. I learned this lesson the hard way, years ago when I caught her pink-eye from using her mascara. Clean your brushes once a month with something like Cetaphil or Johnson's baby shampoo. First, fill your sink with lukewarm water. Then, put a small amount of your soap in your palm. Wet the brush (only the bristles!) just a little. Work a little bit of the soap into the brush and then rinse gently. Let them air dry over night by putting the handle on the side of your sink or tub and letting the bristles hang off the edge. When you don't wash your brushes, bacteria builds up quickly which will cause your cosmetics to break down more quickly (not to mention a pimple or two!). If you clean them once a month, you'll have fewer breakouts and your products will last longer. You need to clean your brushes depending on use. Foundation brushes need to be cleaned often. If you wear foundation everyday and use the same brush- wash every other day to prevent the build up of bacteria. If you don't use the brush as often then maybe every week or if you barely use brushes then a couple of times during the month. I have ecotools brushes and to be honest I use dish-washing liquid to wash them. They have not disentegrated and still have their softness to them and have not shed after a year. I suggest only to replace brushes once you have noticed that texture is no longer the same or if it's shedding on your face when applying product. I like to keep mine in a makeup bag or you can take an old coffee can, dress it up/design it to your hearts content and you use that to put your brushes in. Dish washing soap. Clean your brushes often. I like to just fill a plate with soap and rub my brushes around in them. Rinse them after until the water runs clear. Now, to not dry them out, rub a little bit of olive oil on them. Rinse again. To store brushes: These are called brush guards. They are really cheap and work great. They keep the shape of your brushes nicely. Put the brush guards on your brushes and dry them upside down in a cup. This prevents the glue holding the bristles in from getting ruined. If you apply concealer or foundation to open wounds (such as a spot) then that brush needs to be cleaned DAILY and NEVER double dipped in the product. Invest in some alcohol cleanser from a drug store, put on a tissue and clean til no product residue remains. If you use 'wet' products such as foundation, concealer and creams on regular skin, then the brushes need washed or cleaned ONCE a week to prevent dirt, bacteria and product build up. Either use the alcohol or wash in non volumising shampoo in warm (not hot) water. I'd advise not using handwash or baby shampoo which strip the natural oils of hair brushes very quickly and shorten their life span. NEVER fully immerse the brush in water. Only dip the bristles in the shampoo and water. If you've gone over the metal join, you've just ruined the brush. If the brushes are very dirty or you use waterproof products, dip them in oil (any oil, even from the kitchen) and rub gently between forefingers before shampoo and water. To dry larger brushes such as powder brushes without knocking them out of shape, hold them in the palms of your hands and spin them so the water flies out and leaves the bristles separate. Wrap in a thin tissue like you would cutlery in a restaurant and lay flat on a shelf with the bristles hanging over the edge. Do the same without tissue to smaller brushes. Replace sponges WEEKLY no matter what kind of skin you have. Wash powder compact inserts and powder puffs WEEKLY. Same shampoo and water trick. Leave to air dry. Your skin will probably improve massively without spending any money if you keep everything very clean. I've lost count of how many clients were spending serious cash on acne regimes of persistant spots only to have them clear up in a week or so when they stopped using unclean products. Do-it-yourself clarifying shampoo: mix in some baking soda (I repeat, baking SODA, not powder) with your regular shampoo, lather and rinse as usual. But be warned! This may strip color out of your hair. I'm not entirely sure, since I've never dyed my hair! Joico's K-Pak Chelating Shampoo has changed my life. I use it about once a month to clear hard water buildup. But apple cider vinegar does the trick too (I just don't like smelling like a salad the next day). Makeup comes out with soda water, I've found. Preferrably something like tonic. Also, a damp, almost-dry sponge (or sturdy paper/cloth towel) will take care of deodorant stains no problem. For deodorant stains: Shout wipes! If you're a slob like me, just keep a box everywhere - I've got a few in my purse, a box at home, and a box in my desk at work. They scrub the deodorant stains right out. I forget where I first heard this, but to remove a deodorant stain from clothing, rub it with a clean, dry makeup sponge. I keep one of those cheapy, wedge ones in my bag for such deod emergencies. It works like a charm. You know those little pantyhose socks they give you when you try on shoes? Either ask for a handful, or use your nylons that get a crazy run (if you have any, I only wear them enough to have one pair at any given point). Wear it like a glove and brush the stain in short quick strokes going in one direction, then the opposite direction. It will work for dust and lint too (on smooth fabrics). It's magic, I tell ya! Didn't see your question answered? Be sure to check through yesterday's thread, which is filled with tips and tricks from your fellow readers. Disagree with some of the advice you see here? Feel free to set the record straight in the comments. And as always, suggestions (either in the comments or by email) for our next edition of Beauty 101 are welcome.